For older adults, the benefits of good nutrition are endless. Healthy eating can improve memory, increase energy levels, strengthen the immune system, speed up recuperation, help manage chronic health problems and more. But nutrient deficiencies and malnutrition are not uncommon among seniors. March is National Nutrition Month, an opportunity to emphasize the importance of a well-balanced diet for healthy aging. As we age, our nutritional requirements change. The body’s daily energy needs slowly decrease, so fewer calories are necessary to fuel the body than when we were younger. The impact of our eating habits shift, as well. Natural hormone changes make the body prone to depositing more fat, especially around the middle, and can stagnate muscle building. Bones lose mineral content more rapidly than before, and plaque buildup can naturally occur in the arteries. A healthy diet, combined with moderate physical activity, can help maintain a healthy weight and slow the effects of aging. And researchers are now also making links between nutrition and memory, giving us yet another reason to start making healthy improvements in our eating habits, one forkful at a time. Reducing low-density lipoproteins (LDL), or “bad” cholesterol. Do this by consuming more fiber and omega-3 fatty acids. Increasing high-density lipoproteins (HDL), or “good” cholesterol. Do this by avoiding trans fats and alcohol. Reducing other harmful lipids (fatty molecules), such as triglycerides. Do this by limiting sweets and refined carbohydrates. High-fiber foods, such as fruits, vegetables, legumes, whole grains and nuts. If you’re not eating enough fruits and vegetables, you’re not alone. According to the Centers for Disease Control and Prevention, only 21 percent of adults eat the recommended amount of fruits each day, and only 33 percent consume the daily recommended servings of vegetables. Low/fat-free dairy products. As you decrease the fat in dairy, you also cut calories, saturated fat and cholesterol, while protein, calcium and most other vitamins and minerals remain high. Lean meats and fish. Add seafood, lean meats, poultry, beans, eggs and unsalted nuts for protein, which helps build muscle mass. Omega-3 and omega-6 fatty acids, considered “essential” fats because they help build healthy cells and maintain brain and nerve function. They’ve also been found to lower blood pressure and heart rate, as well as improve blood vessel function. Omega-3 fatty acids can be found in oily fish such as salmon, tuna and mackerel, as well as vegetable oils, walnuts, leafy greens and flax seeds. Omega-6 fatty acids are found in vegetable oils such as sunflower, safflower, corn and soybean, as well as nuts and seeds. When it comes to healthy eating, what you don’t put in your body is as important as what you put into it. Setting some healthy limits will help you reach your dietary goals. Control your portion size. How much you eat is just as important as what you eat. Use smaller plates to help limit portion sizes and be mindful of serving sizes. For example, one serving of pasta is 1/2 cup, or about the size of a hockey puck. A 3-ounce serving of meat, fish or chicken is about the size of a deck of cards. Limit sodium. About 90 percent of Americans eat more sodium than is recommended for a healthy diet. Try to limit sodium intake to less than 1,500 milligrams a day. This target is especially important for people middle-aged or older, African-Americans and those with high blood pressure. Avoid saturated and trans fats and cholesterol. Limit your consumption of red meat, whole-fat dairy products, shellfish and egg yolks. Steer clear of nutrient-poor foods and added sugars. High-calorie, processed foods often have little nutritional value, especially sugar-filled beverages like sodas. Empty calories can lead to weight gain, putting us at higher risk of heart disease. Limit alcohol. Drinking too much alcohol can raise the levels of triglycerides in the blood. It also can lead to high blood pressure, heart failure and an increased calorie intake. Supporting your pursuit of a more nutritious diet. If you or a loved one needs help shopping for or preparing healthy meals, FirstLight can help. 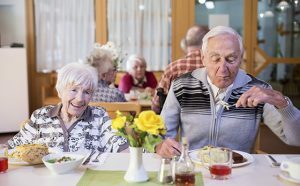 Through our Companion Care Services, our caregivers can prepare regular meals that help you maintain a healthy diet, provide sufficient nutrition for the application of medicines, and simply add joy and comfort to your day. Plus, we can handle all of the clean up, too. Find a location today to learn more. Need some recipe ideas to help you to create easy, healthful meals? Follow FirstLight on Pinterest for some culinary inspiration.